Why be the sheep, when you can be the wolf? 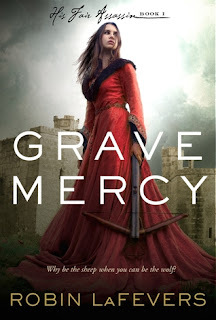 Ismae's most important assignment takes her straight into the high court of Brittany—where she finds herself woefully under prepared—not only for the deadly games of intrigue and treason, but for the impossible choices she must make. For how can she deliver Death’s vengeance upon a target who, against her will, has stolen her heart? 1. (+) Ismae, the protagonist - Strong, clever, dedicated to fulfilling Mortmain's (Patron Saint of Death) wishes, really knowledgeable about poisons and shooting crossbows (aka kickass). You feel for her from the start when you see what her arranged marriage was like, how birth mark brings out her father's cruelty. Sometimes it bothered me how much Ismae referred to Mortmain, but it's a part of her character and her character development, and it wouldn't have been right for her not to look for comfort in the saint and not to question her religious beliefs and her purpose. 2. (+) World-building - Absolutely wonderful. From the clothing to the way people talked to the Duchess' court and its decorum and the weapons and poisons and beliefs and the convent's way of handling Mortmain's will--everything was exquisite, and I can't wait to unravel more details in the next book. 3. (+) Romance - Admittedly I wasn't Duval's hugest fan at first / didn't sense the chemistry between them but the romance grew on me. Duval was nice and listened to Ismae, understood her passions and had his own, was incredibly devoted to his family and his sense of purpose in life. One other negative was that at times it felt too paranormal-y--that this one man was the guy whose touch was special to Ismae from the start. But once they start talking and we learn more of Duval, it didn't bother me. It got better, and I could understand what Ismae was going through and how Duval fit with her. 4. (+) Character cast - There are a whole lot of characters in this novel--necessary for the political drama--but Robin LaFevers manages to make each and every one of them distinct. I particularly liked the Duchess and Duval's friends, and I'm looking forward to finding out more about Sybella in the sequel. 5. (+) The Ending - Yeah, it's a happy ending like most YA novels, but this functions like a stand-alone novel though it's a trilogy, so thankfully everything wraps up nicely... and I also liked how the protagonist stayed true to herself with her decision at the end. 6. (+) Complexity - Plot & villains because nothing is straightforward in a story filled with court intrigue as Ismae and others seek out those who mean to harm the Duchess. 7. 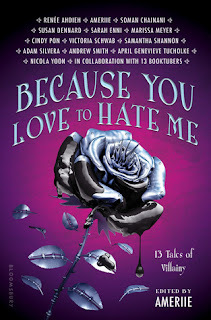 (+) Mystery/Unpredictability - Robin LaFevers did a great job with this-- there were a lot of potential villains to sort through, and though I did guess who the true villain was, I wasn't 100% positive I was right. 8. (+) Writing - Masterful. Never once did I doubt that I was reading from the perspective of someone in that time period. More than that, it flowed really well, which is extraordinary considering how we tend to view writing from older times periods as being "dense" and "harder to read." 9. (--) Pacing - Only true negative of the book. It's necessary to include Ismae's harsh beginnings and how she ended up in the convent, but a part of me really wanted to skip that part and find out when she meets Duval so that she'd get to the court and the mystery would begin. The pacing in the beginning is really slow. 10. (+) The Cover - Captures the historical feel and the protagonist's nature really well. Only complaint I have is the font of His Fair Assassin. I don't like the cursive there--seems out of place. Historical fiction at its best with a strong heroine, brave romantic interest, and a tense political situation with enough court intrigue to keep you at the edge of your seats--everything a reader could want and more.